House Democrats held a birthday party and a press conference on Monday. There were lots of people and even a cake. But it was a pretty somber affair. House Minority Leader Rep. Scott Inman, D-Del City. House Democratic Leader Rep. Scott Inman said he wanted to remind people about the 25th anniversary of House Bill 1017, a huge education reform and tax package passed by the Legislature and signed into law in 1990 by then-Gov. Henry Bellmon, a Republican. The measure was controversial. Because of its funding and the tax increase on businesses, shortly after the bill became law, a business group, upset by the tax increase, attempted to repeal the law. The repeal effort went to a public vote. HB 1017 survived, but not long afterward Oklahoma City stockbroker Dan Brown helped form a group called Stop New Taxes and successfully launched an initiative petition to limit the Legislature’s ability to raise new taxes. That initiative petition became State Question 640, which requires all tax increases be approved by either a three-fourths vote of the House and Senate or a majority vote in the next general election. Since then, Democrats say, many of the gains enabled by HB 1017 have been lost. 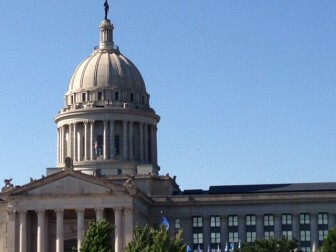 “A quarter of a century later, though, Oklahoma’s public school system is still ranked near the bottom nationally because the quality measurers in HB 1017 were never fully actualized,” said Rep. Donnie Condit, D-McAlester. According to a source close to the governor’s office, lawmakers will tap both “rainy day” and revolving funds to cover part of the budget shortfall. Most agencies will see cuts, but education, corrections and two health agencies may not.